January’s birthstone is the garnet, so this is the perfect time to unveil my latest creation for ANZA Gems: a 20.36-carat rhodolite garnet “man brooch” accented with seven rose-cut diamonds and set in 18K yellow gold. The finished man brooch on a lapel. All of my ANZA designs are special because I get to work with ethically mined gemstones that give back to the mining communities. This brooch, however, is extra-special, because it was created as a birthday gift for Dave, the handsome husband of ANZA’s gorgeous founder, Monica Stephenson. Dave’s birthday is in November, meaning his birthstones are topaz and citrine, but the pendeloque cut and rich color of this Tanzanian garnet appealed to him so much that he was inspired to request it for his birthday brooch, leaving the final design left to me and Monica. Dave is obviously daring than your typical suit-wearing man! He’s a good example of my “Never Is the Next New Thing™” observation: While he’s not in the jewelry industry himself, he’s gone with Monica to the kind of jewelry-related gatherings where it is possible to spot at least one gentleman wearing a statement brooch on his lapel. (In fact, if jewelry expert and stylist Michael O’Connor showed up to an event without a glittering diamond piece, I’d be quite disappointed!) So no discreet lapel pin or tie pin for Dave … he was ready for the big time! I’ve written before about my reasons for giving my ANZA designs a look distinct from my own signature collection, which include my desire to keep the focus on the ANZA gems themselves. 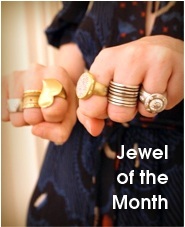 In addition, a number of jewelry designers collaborate with ANZA, and I want my ANZA pieces to complement the others in the collection. There were additional considerations for this particular design. The size of the finished piece was particularly important, for instance. The brooch had to take up the right amount of space on the lapel without making Dave feel too blinged-out. 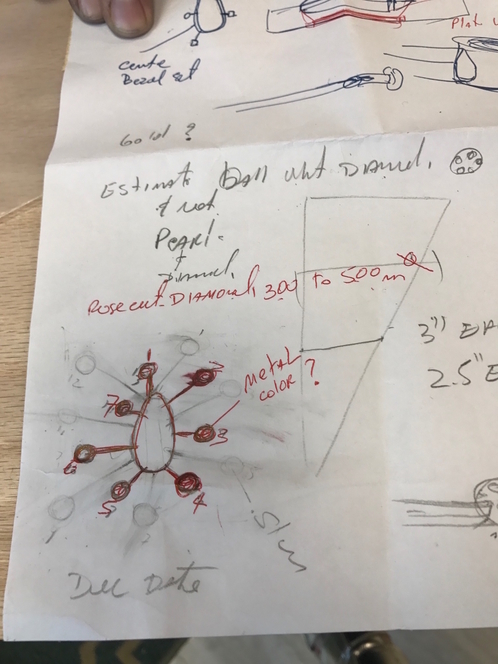 My original sketch included a gold “frame” around the garnet, with spokes between the gem and frame in order to hold the latter in place. That’s the real garnet sitting on top of the sketched brooch in the lower left corner. I told Monica that if the size of this design seemed overwhelming, we could adjust the concept and, as you can see from the first photo in this post, we wound up getting rid of the frame while keeping the originally functional spokes as decorations. I then played around with the idea of adding more spokes, which you can see from the erasures on the sketch below. I also considered decorating the spokes with pearls; pearls set with diamonds; gold balls set with diamonds; or various sizes and shapes of diamonds. Ultimately, Monica and I agreed to streamline the design in order to devote part of the budget to a feature that isn’t even obvious to the casual observer. 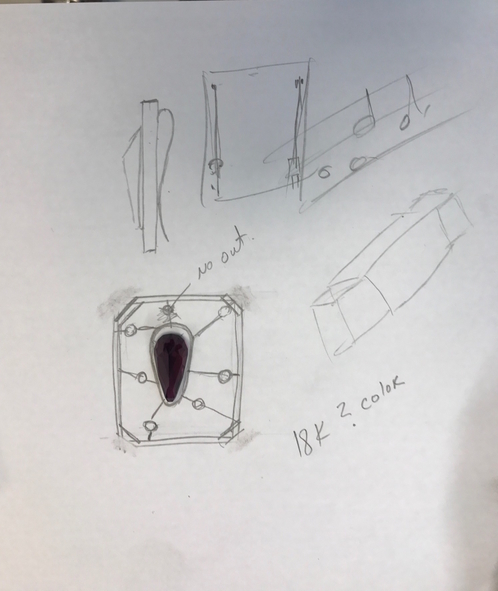 Because Dave’s suits are dark colors and the garnet itself is a deep hue, I put an 18K white gold plate behind the center stone to reflect light into the gem and prevent the color of the garnet from being dimmed by the suit fabric. That made the design more complicated — and added metal and labor costs — but, as the saying goes, quality is what you do when nobody’s looking. I also wound up making a special closure for the brooch, because all the ready-made clasps and pins were too large or didn’t hold the brooch as evenly as I wanted. I don’t believe in shortcuts. 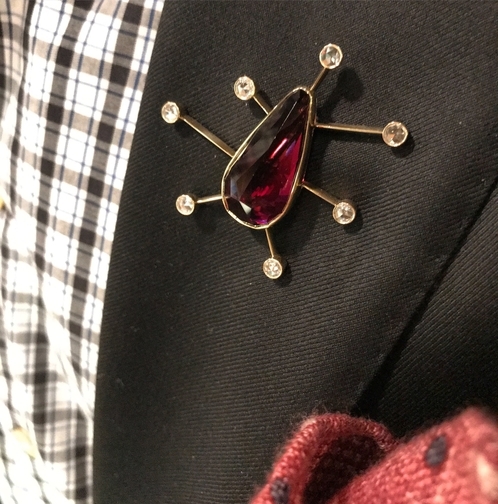 Dave’s brooch is obviously one-of-a-kind and not for sale, but if you’re looking for some ANZA garnets of your own, don’t forget my new ANZA PURE collection. The pink stones are spinel (August’s birthstone) but those juicy green gems are garnets. Contact ANZA to inquire about those pieces. 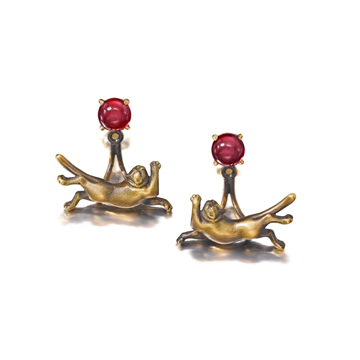 For a more traditional-looking birthstone stud, check out the cabochon earrings featured last week by Amanda Gizzi in National Jeweler’s Style File. 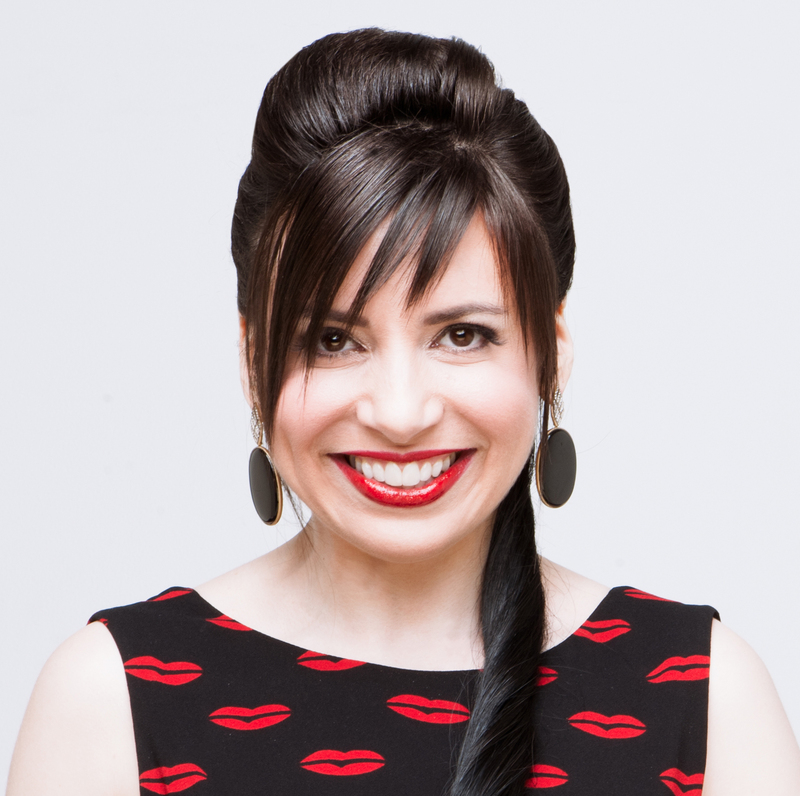 They’re shown on my website with an 18K yellow gold earring jacket that makes them the perfect gift for the cat lady in your life. These have to be made to order, but better a great, late gift than a mediocre timely gift, right? You can also order them without the cat earring jacket. 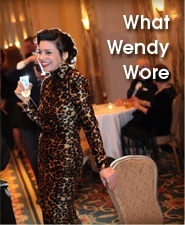 Email me at info at wendybrandes dot com to discuss!